The OpenNebulaConf EU 2017 happened this month in Madrid, with keynote speakers including BlackBerry, Trivago, Runtastic and the Ministry of the Flemish community. More information in the wrap-up post, where all the videos, pictures and slides for the conference has been made available. OpenNebula Systems added as a benefit for support subscriptions hotfix incremental releases. While OpenNebula is fully open source, packages from hotfix incremental versions are not publicly released, and are only available for users with an active commercial subscription. However, rest assured that the code is publicly available in the GitHub repository, as is the templates to create packages for the different supported platforms. Also, a numerous set of bugfixes were included in 5.4.2. The team is finishing the roadmap for the next OpenNebula version, 5.6. Not a lot of time or space to fit more functionality, but it is still worthy to let us know about the features you’d like to see in OpenNebula! A beautiful post about CloX, a solution based on OpenNebula and LXD, features in the OpenNebula blog this month. We think CloX shows one of the many strengths of OpenNebula, it’s small footprint, which enables several interesting use cases. you can expect an easy of use, fully featured cloud orchestrator with minimum overhead, great performance and reduced deployment times. CloX is meant to be deployed over Single Board Computers (SBCs) based on ARM processors providing low capital expenses and power consumption. Newcomers might find it hard at the beginning to understand all the concepts behind the OpenNebula platform. This is why having the community produce detailed tutorials on how to install OpenNebula in specific platforms, such as this example, are great contributions to the project since they go at great lengths to foster OpenNebula adoption. It is always a pleasure, and a great honor, to discover new services and business that base their IaaS management needs on OpenNebula, like Wedos VPS does, as well as several other hosting companies. As usual, we want to give two thumbs up to the brave people that helps other OpenNebula users in the community forum. Kudos to you! The OpenNebulaConf 2017 EU in Madrid was a big success! A big turnout, excellent keynotes, brilliant talks… and a very positive atmosphere created by all the attendees delivered an excellent experience. We would like to send a big thanks to everyone involved and hope to see you all again next year! Specially to our keynote speakers, but in general to everyone that shared their experience running OpenNebula, several for many many years, other with big plan aheads. We are honoured to be a part of the stack that enable your business to be truly great! All the videos of the conference has been uploaded to our YouTube account, slides to SlideShare and picture to Flickr. Check the wrap-up post for more details. Last week, we celebrated OpenNebulaConf 2017 EU. We had a lot of wonderful attendees and great speakers that delivered really interesting talks and shared their experiences. We would like to send a heartfelt thank you to the community members, speakers and friends that made this possible. If you missed the conference, now you have a chance to watch the talks in the YouTube playlist, download the slides or take a look to the pictures of the conference. Enjoy!, and stay tuned for news about the upcoming OpenNebulaConf editions. It is beyond any doubt the advantages that Cloud Computing has brought. Today, most companies have the need to adopt this paradigm in order to stay competitive on the market. Big and some medium size companies choose to deploy their own Private Clouds, inside their facilities. This is not the case for small companies who usually deploy their services over Public Clouds. The security, adaptability and economic feasibility of using Public Clouds are huge issues, and this is the reason why big companies have Public Clouds out of the picture. Why rent something when you can own it? Are small companies wrong? Are they wrong to resign to Private Cloud? Not necessarily, because the initial costs and complexity of current Private Cloud solutions are huge drawbacks, so small companies either can’t afford it or it is not profitable. This is the reason why CloX came to live. CloX is a solution for small companies, enabling them to easily and cheaply deploy their Private Clouds and stop depending on Public Clouds. It is based on OpenNebula and LXD, so you can expect an easy of use, fully featured cloud orchestrator with minimum overhead, great performance and reduced deployment times. CloX is meant to be deployed over Single Board Computers (SBCs) based on ARM processors providing low capital expenses and power consumption. Edge and Fog Computing: The Internet of Things (IoT) devices explosion and the need for low processing times in some applications are making huge and centralized data-centers unable to handle the load. Edge and Fog Computing aim to solve this by placing computing capabilities at the network edge. Companies and researchers promote the use of “cloudlets”  although there is no general agreement on it’s architecture. CloX team is making an effort to prove CloX as a viable “cloudlet”. High Performance Computing (HPC): The race towards achieving exaflop/s-capable systems is predicated on reaching this performance level within a 20MW power ceiling. Many researchers are trying to decrease this consumption . In this paper, the authors conducted benchmarks towards an Infrastructure as a Service (IaaS) platform deployed with OpenStack over a Raspberry Pi cluster using LXC as hypervisor. The findings showed a performance degradation induced on the demanding HPC applications by the cloud middleware. By using OpenNebula and communicating with LXD directly over an API, which solves the causes for the performance degradation, CloX team expects much better results. Tests are pending, numbers will be shared once the benchmarkings are concluded. Cloud simulations: A typical cloud data center usually contains tens of thousands of servers, making prohibitively expensive for an educational or research institution to construct one. Even a practical testbed consisting of a reasonable number of servers (say, 40 machines) can still be out of the reach for most researchers. Some researchers have instead focused on developing Cloud Computing simulators. While simulation has in the past been used to successfully model some of the underlying state of a target system (such as within network simulation), it fails to capture essential Cloud Computing properties in a number of ways. CloX might be used as a scale model of a data center. This idea was already proposed by the Glasgow University. We would love to get feedback from OpenNebula’s community and people interested on the suggested topics. We welcome interested contributors. The OpenNebulaConf EU 2017 is around the corner! This month in Madrid, keynote speakers such as BlackBerry, Trivago, Runtastic and the Ministry of the Flemish community, as well as other prominent members of the OpenNebula community will be sharing their experiences with OpenNebula. There are limited seats, register ASAP! Scroll Bar in Sunstone VM Log. Add boolean to option list for User Inputs in VM template. Additional confirmation level for critical actions and VMs. fsck should locate the image based on just the name. Add volatile disk should allow user to specify size in MB as well as GB. Explain how to add HTTPS to XMLRPC. Wild VMs should import NICs and Disks. Ease DS selection on VM Template update and instantiation. Add scheduled actions to VM Templates. When a MarketplaceApp is removed from the MarketPlace it should be removed from OpenNebula. Add a custom css so it can be overridden easily for branding purposes. Also, multiple bugfixes related with vCenter and Sunstone, as well as in other subsystems has been fixed. Take a look at the release notes for an exhaustive list of changes introduced in this version. Based on OpenNebula 5.4.1, the latest version of vOneCloud (3.0.2) has also been released, bringing all the new functionality to the best cloud manager on top of vCenter. This month the team is set to prepare the roadmap for the next OpenNebula version, 5.6. It is the perfect time to let us know about the features you’d like to see in OpenNebula!. Having our community spread the word about OpenNebula is the best thing that can happen to an open source project. It was somewhat of a surprise to learn that in the AWS summit in Madrid,folks from Securitas Direct showcased their development cloud built on OpenNebula and Ansible. Pretty cool stuff! Also, having long time partners like NodeWeavers winning relevant prizes fills us with pride and joy! Kudos from here and thanks a lot for believing in us! Spanish native? You might enjoy this podcast on OpenNebula and other development related interesting things. The OpenNebulaConf EU will take place in Madrid, Spain, this October. You can check the agenda for more details, keynotes feature BlackBerry, Trivago, Runtastic and the Ministry of the Flemish community. Also, make sure you register if you’ll be on the area! Watch the talks in the YouTube playlist, download the slides or take a look to the pictures of the first US edition of the OpenNebulaConf that happened in Boston this past June. 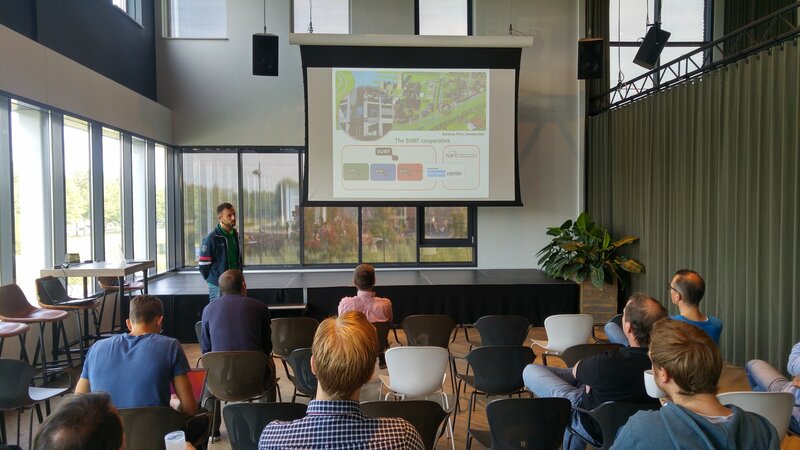 This past month members of the OpenNebula team traveled to Ede in the Netherlands to give an OpenNebula TechDay, hosted by BIT.nl. It was a beautiful experience, we are always glad to see that the OpenNebula community in the Netherlands is one of the healthiest! You can check here the list of talks.